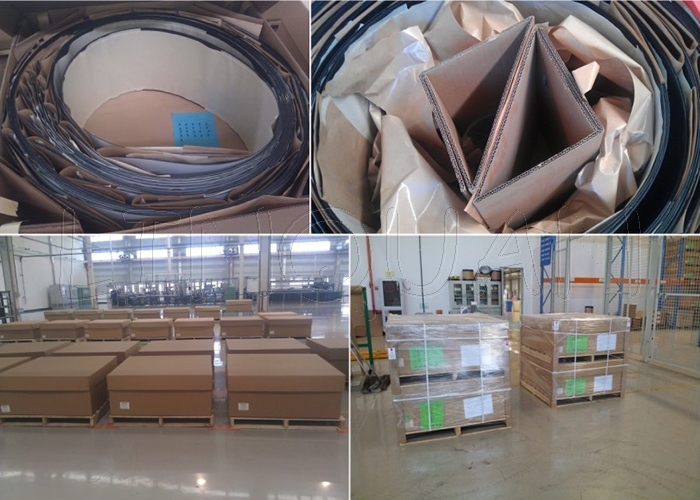 With back adhesive tape or non-adhesive film back, offers a wide options of installation methods for customers. The products are specifically designed for rooftop installations. These products all use the bandgap-tuned triple-junction thin-film silicon solar cells. We also welcomes inquiries for custom sized product. Our flexible manufacturing process can allow us to offer custom product at relative low minimum volumes. Our thin film flexible solar modules can be utilized for either on-grid or off-grid applications and they come backed by our 25 year power-output warranty. Our solar modules are produced using the innovative and patented manufacturing process and are designed to deliver high energy efficiency at a low cost for years to come. About the efficiency, while conventional solar panels have efficiencies topping 20%, thin film solar panels are only are about 8% efficient. Technology Review gives the example of one of thin film flexible18' long panels producing 330w,whereas if that same area was covered in conventional crystalline silicon panels in would be 740w. 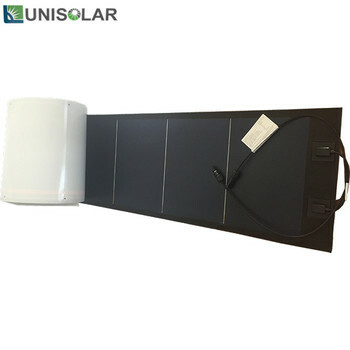 Flexible solar modules are produced utilizing a thin stainless steel substrate and flexible lamination polymers which equate to a thickness of ~1.5 mm. This allows our modules to be used for a wide variety of applications. 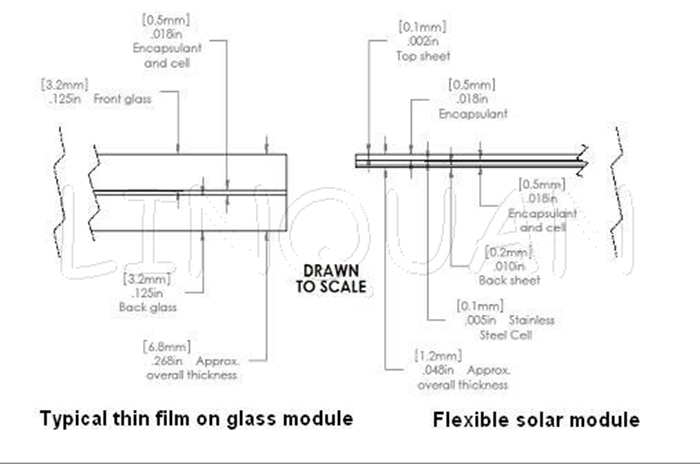 Flexible solar modules(~.5 lbs/sq. ft) are roughly three times lighter than rigid glass based PV modules, which means they can easily be installed on rooftops that may not be able to take the weight of glass modules and their support structures without the need for costly roof reinforcement modifications. Thin film amorphous silicon based PV modules offer better power performance in actual outdoor conditions vs. some other solar technologies that currently dominate the market. Our solar modules are flexible and lightweight and do not utilize glass which make them very durable and resilient to most weather conditions. Our products can be integrated into a building’s roofing membrane or rolled on and adhered which allows for easy installation and also eliminates the need for roof penetrating racking structures. Below is a comparison of a typical thin-film CdTe glass panel (~5 to ~6.8 mm thick) and our flexible, thin-film silicon module on stainless steel (~1 mm total thickness). 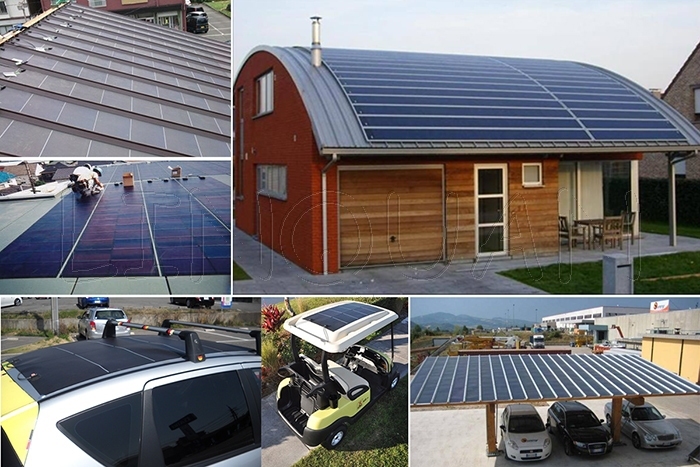 Roll-up thin film solar panels on stainless steel plates are manufactured by a roll-to-roll process. Which allows thecompany to produce triple junction thin film silicon solar cells on rolls of thin stainless steel substrates, three feet wide and up to one mile long.The long stainless steel web is guided through a series of vacuum chambers for the deposition of nine semiconductor layers using a plasma enhanced chemical vapor deposition process,and back-reflector and top electrode layers using a sputtering process. The combined thickness of the layers for the triple junction solar cell is approximately on hundredth of the thickness of typical sheet of paper.Therefore,only a small amount of silicon is used. We have made advancements to the manufacturing process that allows it to market these products at a very attractive price point. However,the basic technology used in the cells and packaging techniques used in the modules are well proven,preditable and have an operating history of over then years in the field. To produce tf-Si modules,we utilize its proprietary high-speed,low-cost roll-to-roll manufacturing process.This automated process allowes us to transform a roll of steel 3 feet wide by a mile long into highly efficient solar cells. As the metal foil is rolled,plasma-enhanced chemical vapor deposition systems and a magnetron sputter deposition system apply a chemical compound creation high-quality thin-film silicon solar cell. Once the solar cells are created,the mile-long roll then moves to the module manufacturing stage where the individual modules are fabricated into finish product.During this significantly automated process,the solar cells are cut to specs,wired,encapsulated,and packaged,which ultimately results in durable,flexible,lightwieht,and powerful solar modules. Or according to your requirement.